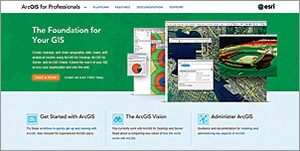 The ArcGIS for Professionals website helps Esri's customers get the most out of ArcGIS and maximizes their effectiveness and success in a wide array of GIS applications. Esri has released a new website to serve the needs of the professional user of ArcGIS at pro.arcgis.com. This website offers organized resources and best practices for professional GIS work. It starts with common tasks, such as data compilation, mapping, GIS analysis, and how to organize and conduct complex GIS projects, and progresses to provide a critically important perspective for how professionals use the new web GIS pattern. ArcGIS users have quite a comprehensive understanding of using ArcGIS in traditional ways but are new to the web GIS pattern. Getting that exposure can really open their eyes about how it is relatively easy (compared to the GIS heavy lifting they're used to) to provide new tools and applications that benefit them in their own realm as they tackle new kinds of problems and grow the use of GIS across organizations. Our goal is to enable the work of these professional ArcGIS users to fully leverage their existing GIS investments and help them extend the reach of GIS to everyone. Says Jim McKinney, ArcGIS program manager, "The work of GIS professionals continues to be critically important and vital and is evolving in support of new web GIS initiatives. Among the key goals we have in mind for this website is to help our professional customers get the most out of ArcGIS and to maximize their effectiveness and success in a wide array of GIS applications. We want to show users how to apply the new web GIS pattern to leverage and extend the reach of their GIS." ArcGIS for Professionals is constantly changing. Check back often as we enhance the content and presentation to keep pace with the evolution of the ArcGIS platform. Jim McKinney discusses the new ArcGIS Professional application.